A few clients have passed away within the first 2 months of this year. 2 of them used to be among the starring characters in my blog when blogs were the "in" thing back in 2007-2009. Remember Zana? Her story was posted under the title "The Problematic Young Woman" which came in a few parts (at least 4 parts, but could be more). She was the first of my many clients who I had to send to shelter homes. In her case, she was pregnant (out of wedlock) and her family, especially her father could no longer accept her in the family. Her older daughter stayed with her grandparents (Zana's parents) while Zana later gave birth to a pair of twins, both boys. One of the twins died while they were still staying at the shelter home, while the other was later given up for adoption due to Zana's lack of responsibility. Zana eventually went back to stay with her family (and back with her daughter). The girl, whom Zana claimed had been tested for HIV earlier but the results were non-reactive, was never brought for follow up tests. By the time she was finally diagnosed, the girl's condition was so bad her CD4 was close to zero. She died at the age of 10. So, 2 of Zana's children died before Zana herself. Zana's turn came in January this year. Apparently, before she died, she asked to see her son (the one given up for adoption). Not sure if such a meeting took place. I don't think so. Some time late January, the wife of a client, Andi (I don't recall posting any stories on him - not much drama), texted to ask if I could assist to get a wheelchair for Andi. His condition had deteriorated and he needed help to move around at home. I managed to get donors to contribute some cash and I went ahead to buy a brand new lightweight wheelchair for him (lightweight so that it wouldn't be too much of a problem if the wife needed to carry the wheelchair in and out of their old van). I sent the wheelchair to them on Friday. Just 3 days later, on Monday, the wife called to inform me that Andi passed away in the morning. The very next day, I received a call from an unfamiliar number. The moment I answered the call, I heard the voice of a girl, calling me Makcik Fizah. Initially I thought it could be Andi's daughter, but then she identified herself as Yah's daughter (I think many of my blog readers would be very familiar with the name Yah). "Nak bagitau, mak dah meninggal semalam." Apparently both Andi & Yah, miles apart, died on the same day. Both Andi's & Yah's children are still under the Buddies Education Sponsorship Program, so I shall still be monitoring their schooling needs. Andi's children will be getting their assistance through their mother, while Yah's children who now stays with their grandfather, will be getting their assistance through the eldest girl who just started working a few month's back. Other updates? After a 4 year break, I am back as the Buddies Chairperson. Obviously we don't have enough people in the organisation, so we even had to recycle the chairperson. It has been a week since I came back from a wonderful holiday in Sabah together with 11 friends. Initially I didn't intend to update my blog about it, but I've been getting queries from some friends regarding my itinerary etc, so I guess I might as well update my blog so if anyone else asks, I'll just give them this link. Besides, I did the same thing for my last 3D2N Cuti-cuti Sabah in February last year. You can read that story here. This time, we headed to another part of Sabah. Instead of landing at KK Airport, this time we landed at Tawau Airport, enroute to Semporna. And unlike my previous Cuti-cuti Sabah (KK-Kundasang trip) where I had to deal with a few separate people to make all the arrangements, this time I booked direct with Lato-Lato Resort for a full 3D2N package inclusive of airport transfer, boat transfer, accommodation, food, and island exploration tour. Saturday 8th September 2018 - We all booked the 7.40 am flight to Tawau. Unlike the rest in my group, my journey started from Ipoh, so I had to leave home just after 1am to catch the 2am direct bus from Ipoh to KLIA2. I decided to park my car at Terminal Aman Jaya, Ipoh, so it'll be easier for me when I come back, as I expect to arrive Ipoh also in the wee hours of the morning. After dropping off my baggage, headed over to the prayer room for my subuh prayer. After that there was another long queue getting in to the departure hall. Saw a few people heading over to the front of the line under the pretext of weighing their cabin luggage, and then simply jumping queue from there. Our departure gate was J20, and with J22 being the last gate, that meant we had to walk quite a distance to get to our departure gate. But I shouldn't be complaining I guess, since my morning briskwalk is usually 5km and takes about an hour. As soon as I switched on my handphone after landing at Tawau airport, before I could even step out of the plane, my phone rang. One lady who was doing the arrangement for our transport to Semporna, called to ask if we had landed. I told her I was just about to step out of the plane and would call her once we're out. That took quite some time, having to queue through immigrations, waiting for our baggage, and of course, our toilet stop on the way out. By the time we left Tawau airport, it was close to 11.30 am. There were 12 of us, and since the vans could only take 10 pax each, we had to go in 2 separate vans. 10 of us in one van, while the other 2 joined another 5 tourists, also heading over to the same resort. One van sped far ahead of us (I was later told the guy was driving at 140km/hr at the maximum 90km/hr road), but when our van got to the jetty in Semporna, we didn't see the other 2 members of our group. When we called our 2 friends, they said they were also already at the jetty. So, why couldn't we see each other? Apparently, our van brought us to the wrong jetty! We had to get our bags back into the van so the driver could take us to the right jetty. Our boat left the jetty around 1.20 pm, by which time, most of us were already hungry. It took another half an hour or so from the jetty to get to Lato Lato Resort. And what a sight it was when we first saw the resort. What a view! The water was crystal clear! The resort is in the middle of the sea, built on stilts in the shallow waters off the coast of Semporna. At that moment we knew it was going to be a wonderful relaxing holiday. Since we were all already hungry, after checking in (by writing our names and particulars in the book provided), we had our lunch before getting our rooms assigned to us. Staying in resorts like this one, you don't have to worry about arranging for activities. 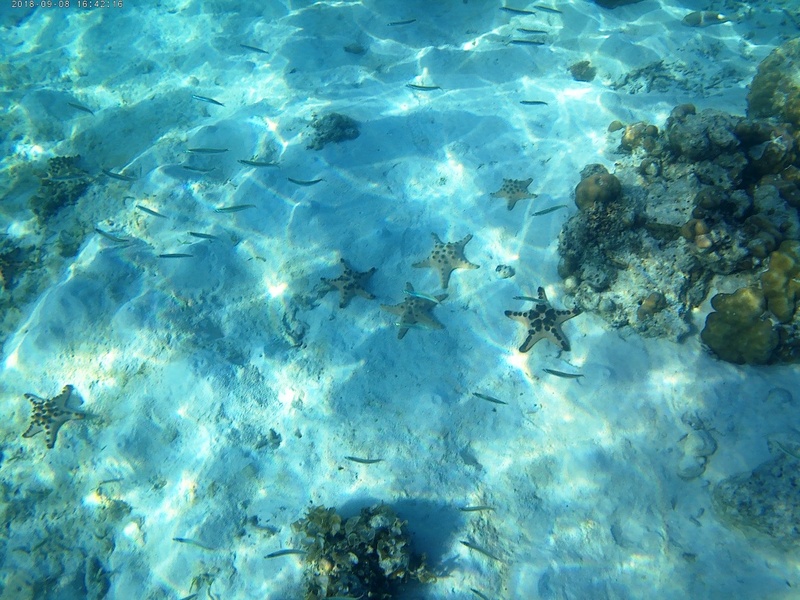 You can snorkel/swim anytime you want! 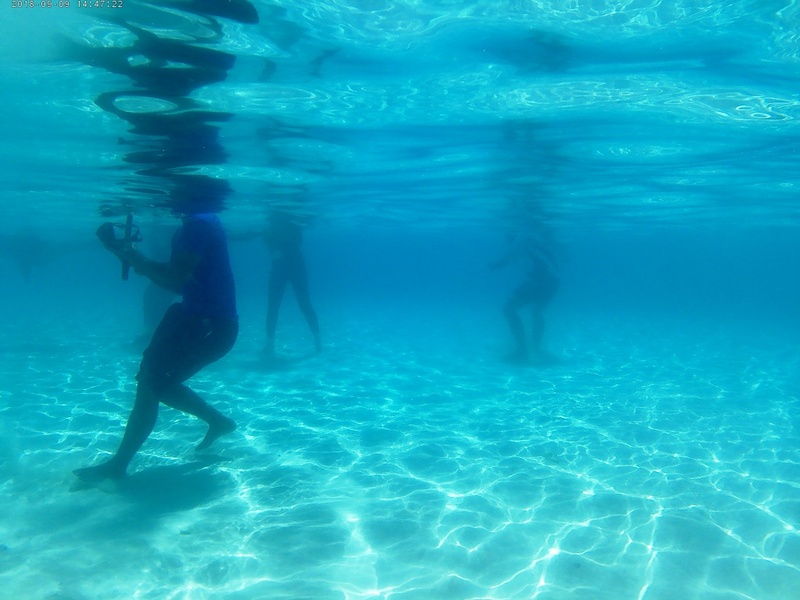 However, even though life jackets and snorkeling masks are provided without any extra charges, when the resort is full, there may not be enough for everyone to use at the same time. 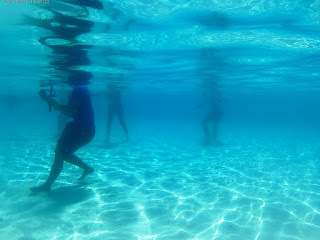 So if you can swim and can do without the life jackets, it may be advisable for you to bring your own snorkeling mask. View from inside our room. While some of our group members were having a good time snorkeling/swimming, we had freshly made doughnuts delivered to our rooms. They were still warm and oh so yummylicious. Another boost to our holiday... beautiful sea view, away from the hustle and bustle of the city, freshly cooked doughnuts delivered to our rooms... it was bliss! I was planning to capture a time-lapse video of sunset, but it was quite cloudy, so no luck there. But the view was still spectacular anyway. After dinner, a few of us decided to borak-borak at the dining area (hot drinks are available 24/7) and it was close to midnight before we decided to head back to our rooms. Good thing we were already back in our own rooms, getting comfortable on our bed, when it started raining heavily. Sunday 9th September 2018 - During breakfast, a group of boys who were staying at one end of the resort, told us that they saw a turtle from their room, but everything happened so quickly they didn't get the opportunity to snap a photo of the beautiful creature. Today the plan was to explore a few islands, including Bohey Dulang. But our boat was only due to pick us up at 10 am, and so after breakfast at 7 am, there was ample time for another round of snorkeling/swimming at the resort for those who wanted to do so. Like I mentioned earlier, even if you don't plan for any other activities, you can simply laze around at the resort. 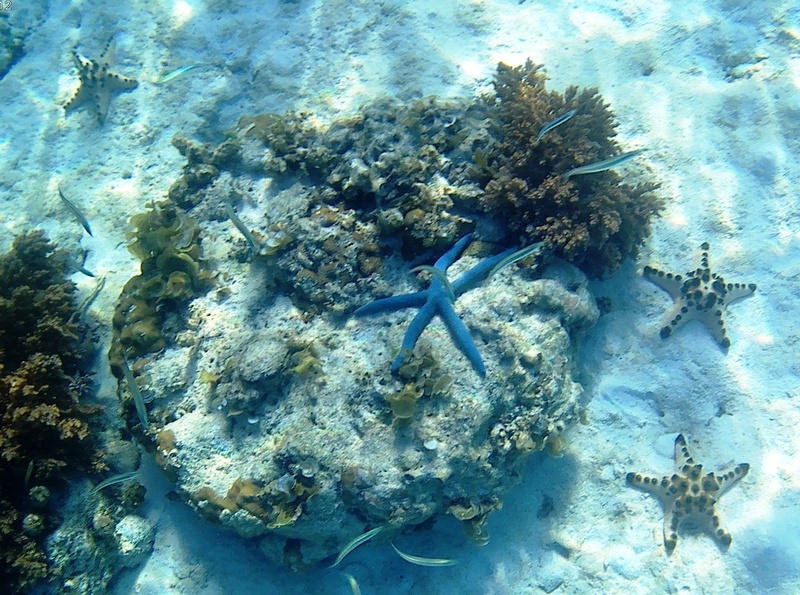 There was no need to hire a boat to go snorkeling. We finally left Lato Lato Resort at 10.30 am to start off our island exploration for the day. It took about half an hour to reach Bohey Dulang, the first of 3 islands in the planned itinerary. The main activity here is to hike 600m up a hill to witness the beautiful view from up there. There was also a Pusat Pembenihan Kima Gergasi there, but it was closed for maintenance, so if you aren't going to hike up the hill, there's not much to do there. No swimming allowed. Those who plan to hike up, make sure you bring shoes. The requirement is that you MUST wear shoes that cover your toes. I thought I was smart enough to wear my hiking sandals, which was suitable to wear even when wet (or so I thought), but no, there was no room for negotiations. There were however, some "adidas kampung" which you could rent from them at only RM5 per pair. Our guide managed to get one pair of adidas kampung from someone who just got down from the hill and offered the pair to me, and since hiking up the hill at Bohey Dulang was one of the main reasons I came, I relented. I don't really mind wearing the adidas kampung, but due to wear and tear (God knows how many hundreds of people had already worn it before me), the pair of shoes I got was so thin and already torn, but what could I say, those who had the authority to let us through would rather I wear those worn out shoes, than my hiking sandals which definitely had better grip, just because those sandals don't cover my toes. In the end only 4 people from my group hiked up the hill. The rest (some of them didn't plan to hike, a few others because of the shoe requirement) had to wait at the jetty, with a big crowd of other tourists. The hill was quite steep, and on the way up, those coming down would encourage us by telling us "sikit lagi nak sampai" (you're almost there). I probably heard the same line every 2 or 3 minutes. Was earlier told by the guide that if you're fit enough, you could probably reach the top of the hill in about 25 minutes or so. I managed to do so in about 35 minutes, so I guess that's not too bad for a 55 year old makcik. And the view from up there was totally worth the hike, although I must say it wasn't really an easy task trying to get a good angle for a good photo shot with the crowd up there. That is especially so if you're planning to take a selfie of yourself or your group... somehow there's always someone's face or arms (or armpits) in the way, but then again, you can always crop your photos later to exclude those unwanted elements. We didn't stay too long on top of the hill. It was crowded, and it also wasn't fair for the other 8 members of our group to wait too long at the jetty. As we headed down, it was our turn to say the magic "sikit lagi nak sampai" line to those who were on their way up. Revenge time! By the time we got back down, we could see quite a huge crowd at the jetty. Some visitors had their lunch there. We headed back into our boats so that we could have lunch at the next island in the itinerary... Mantabuan Island. Am so glad we did, because it was more peaceful there. 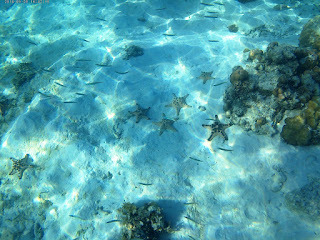 The water surrounding the island was so clear, and the sand was soft too. We chose a shady spot under a tree to have our lunch. But the beautiful clear waters were too tempting to just let go, so despite the hot sun, after lunch some of us did decide to take a dip, especially since the place wasn't too crowded. It wasn't long before the guide called us back to the boat as it was time to head to the last island in the itinerary, Sibuan Island. Before leaving, we did give some goodies we brought along with us to a small group of Bajau Laut boys. We only saw 3 of them. Apparently a few families of Bajau Laut live on the opposite side of the island. 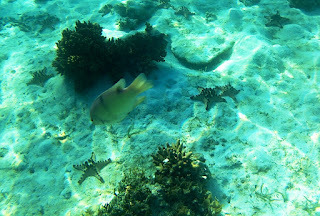 Upon reaching Sibuan Island, we could see that the the place was rather crowded. The island is a popular destination among tourists for snorkeling/swimming. Crowded or not, it didn't stop us from having a good time. The waters surrounding the island was so clear, taking a photo underwater was like taking a photo in a swimming pool! Monday 10th September 2018 - Our last day at Lato Lato Resort. After this, we would no longer be waking up to this view. A few members of our group did manage to catch a glimpse of a turtle sticking its head out of the water for some air. While most of us decided not to jump into the water as we didn't want to have to pack wet clothes in our luggage, 2 of the gals thought that the early morning high tide was the right time to dive. The diving "platform" was the bench just outside one of the rooms. We had to check out of our rooms by 9.30 am, and while waiting for the boat to come and fetch us, we spent the time taking more photos. We left the resort around 10.30 am, heading back to the mainland. We were told that our vans would be fetching us in front of Dragon Inn at 3 pm, so there was more than ample time if we wanted to go shopping. We didn't want to drag our luggage around until 3 pm, so we decided to share a room at Dragon Inn. Luckily there was one room available. They didn't have half day rates, so we had to pay the full daily rate. But it didn't come up to too much with the 12 of us sharing. For lunch, we had seafood at Pearl City Restaurant, which was located at the same place. Shopping? I just decided to buy some small souvenir items from the same complex. Too lazy to go elsewhere. We had a good time. The only negative comment I have about this trip is the lack of civic-mindedness in keeping the cleanliness of our waters. It was so frustrating to see plastic bottles and all sorts of rubbish being thrown into the sea. At Bohey Dulang jetty, we even saw diapers in the water. Nearing mainland Semporna, the amount of rubbish was even worse. If we don't do something now, our future generation may not get the chance to see the beauty of the places we visited. Thank goodness we stayed in Lato Lato Resort instead of any resorts or hotels at the mainland. I miss the place already. Our flight home was on time and landed at KLIA2 about 9.40 pm. I took the 11.10 pm bus from the KLIA2 Transportation Hub and reached Terminal Aman Jaya, Ipoh at 2.35 am. And guess what? Just as I got to the autopay machine to pay for 3 days worth of parking fee, there was a note there, "Boleh keluar terus. Tak perlu bayar parking hari ni." Woohoo! Lucky me! 12th August 2018 - For this year's Family Day, we decided to head over to Perak Agrotourism Resort (PATRO) in Tanjung Tualang, Perak. We chartered one bus from Taiping and another bus from Ipoh. The Taiping group (including a few from Parit Buntar) had to start off earlier as they are further away. For the Ipoh group, we told everyone to assemble by 7.30 am, but only a few were around at 7.30 am. But it wasn't too bad, we managed to make a move by 7.45 am. We were supposed to pick up one family in Simpang Pulai. But as we reached Simpang Pulai, I called up my client and she said she was already there but they wanted to drive on their own and just follow behind the bus. Next stop was Batu Gajah, where we picked up an 11 year old HIV+ girl who was accompanied by her grandfather. We reached PATRO on time, and I was happy to see some of our clients (who drove on their own) were already there. We had already arranged with PATRO to prepare breakfast as we knew many of them would probably be hungry (some had to leave home very early in the morning), so everyone headed straight to the cafeteria first to have breakfast of fried noodles and cucur udang. The Taiping group arrived while we were having breakfast. After breakfast we headed off for the farm tour, in trams and buggies. For the kids, the tram and buggy rides were already exciting enough for them. We visited the chilli farm & the duck farm, given briefing about the activities there, shown a demo on how salted duck eggs are made. We passed by the honey farm, and then we stopped by to see the horses. Horse rides are only allowed earlier in the morning before 11 am, so no horse or pony rides for the kids this time. However they were all allowed to touch and take photos with the horses. Once the farm tour ended, we were all sent back to the cafeteria for lunch, followed by the usual lucky draw (where we made sure none of the children would go home empty-handed) and then brought out a birthday cake to celebrate the birthdays of the August babies. After that, those interested to go for the paddle-boat rides were given a chance to do so, not just for the kids, but also for the adults. We made a move at 2.30 pm, but before we left the place, we stopped by their kiosk to buy some of the things produced there, including salted eggs, honey, drinks, kerepek, and some other things. Overall, it was a success. For me personally, I was happy to meet up with some of my clients whom I had not met for quite some time. Once my clients become independent, I usually start distancing myself from them to concentrate on the more needy families. I would only contact them once in a long while, or they would contact me from time to time just to ask how I was doing. But they are always still invited to join the annual Family Day, no matter how independent they've become. It was so heartwarming to see them still showing their appreciation not just by attending the Family Day but also by their sincere hugs whenever we meet. The children, who are now grown-ups and working, even express their interest to become volunteers. And I was also happy to see a client of mine, who was once so weak and needed to use a wheelchair (or at least a walking stick), looking so healthy. She can already walk all by herself without even the need for someone to be beside her. These are the things which always motivate me to carry on with my voluntary work despite not getting any monetary gains. The satisfaction of seeing the lives of these families change for the better (much much better than before) - PRICELESS!